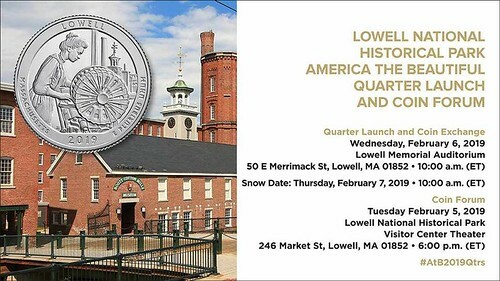 Excitement is building for Wednesday’s launch of the new Lowell quarter. The event begins at 10am (on February 6, 2019) at the Lowell Memorial Auditorium which will be packed with school children and members of the community. Once the formal festivities are over, you can cash in other denominations of U.S. currency for your own roll of Lowell quarters (up to $100 worth). If you can’t make it to the Auditorium, local banks should have a supply of the quarters on-hand by Wednesday. The night before (Tuesday, February 5) there will be a “coin forum” from 6:30 to 7:30pm at Lowell National Park Visitor Center Theater at 246 Market Street. This is an opportunity for members of the public to learn more about the U.S. Mint and the process for designing and creating coins. The Lowell Quarter is the 46th quarter to be released in the U.S. Mint’s “America the Beautiful Quarters Program.” This 12 year undertaking will release quarters that commemorate 56 different national parks and national historic sites. Several years ago, Lowell was selected to be the National Park from Massachusetts. It’s a big deal. Governor Charlie Baker recently unveiled a proposal to create a Global Warming Solutions Trust Fund to provide grants and loans to cities and towns for projects intended to counter the impact of global warming. Funding for this initiative would be obtained through an increase in the state’s Deeds Excise Tax. The Massachusetts Deeds Excise Tax is a tax imposed on the sale of real estate. The seller is liable for the tax which is collected by the registry of deeds when a new deed is recorded. Currently, the tax is $2.28 for every $500 of the sales price, so if you sold your house for $500,000, you would pay a tax of $2,280. The governor’s proposal would increase the rate to $3.42 per $500, so for the same sale, you would pay a tax of $3,420. During calendar year 2018, the Middlesex North Registry of Deeds collected $11,485,820 in deeds excise tax. If the governor’s proposal is enacted, that amount would rise to $17,228,730, with $5,742,910 of that going into the Global Warming fund. This fund could certainly benefit Lowell, especially with flood control or remediation projects along the Merrimack River. In my view, anything that provides funding to combat the effects of climate change is money well spent. But that also leads me to ask, if something is a public priority, why don’t we just pay for it out of the state budget? The reason we don’t is that few elected officials will openly support a tax increase. They are happy to spend the money but no one wants acknowledge the need to pay for it. But in that, elected officials are just reflecting the mood of the public. When it comes to public spending, we all want to benefit from it but few acknowledge the need to pay for it. As someone once said, Americans like everything about socialism but the name. I don’t have a problem with raising the deeds excise tax. Ordinary people don’t sell real estate very often and when they do, it is often at a gain, so paying a small percentage as an excise tax is not unduly burdensome and is a rational means of raising revenue. But the deeds excise tax is also an erratic method of raising revenue because it is based on (1) the value of real estate and (2) the volume of real estate sales. For instance, back in 2005 when the real estate bubble was still expanding, we took in $11.8 million in deeds excise tax at the Middlesex North Registry. The next year we took in $11.7 million. But in 2009, after the bubble had burst, we only took in $5.1 million, the same in 2010, and just $4.6 million in 2011 after which values began creeping up again. So while the deeds excise tax is a legitimate revenue producer, it is also an erratic one, which means funding for climate change resiliency projects will also be erratic. While I’m on the subject of revenue collected by the registry of deeds, I feel compelled to mention the Community Preservation Act. The CPA is a state law that permits the residents of a city or town to vote to add a surcharge onto their existing property taxes. This added revenue must be used for any of four purposes: (1) to preserve open space; (2P to preserve historical sites; (3) to create recreational opportunities; (4) to create affordable housing. As an incentive to participate in the program, the state will match funds raised locally with state funds. The state’s contribution to this effort comes from the Community Preservation Trust fund which gets its money from a surcharge on documents recorded at the registry of deeds. In most cases, that surcharge is $20 per document. To be clear, since 2001, owners of real estate in Lowell have paid $5.8 million dollars into the Community Preservation Trust Fund and Lowell has not received one penny back from that fund. Since it’s unlikely that the current city council will exert any leadership in trying to get the CPA adopted by the voters of Lowell, it would seem like a good opportunity for some organization or group to launch a referendum campaign for the adoption of the CPA. I believe a majority of voters would be receptive to it, especially if the benefits of participating were clearly laid out in the campaign. Absent that, if you’re a Lowell property owner, next time you encounter someone from Billerica, Chelmsford, Dracut, Tewksbury or Westford, ask them to thank you for helping to fund all the great projects their towns have undertaken with CPA funds. 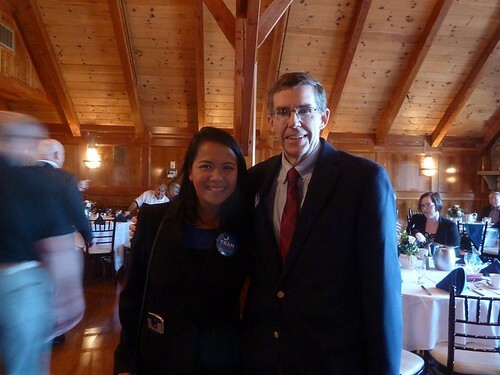 This past November, Tram Nguyen, a legal aid lawyer from Andover and a Democrat, challenged incumbent Republican State Representative Jim Lyons in the 18th Essex District which includes parts of Andover, Boxford, North Andover and Tewksbury. Lyons, perhaps the most conservative member of the Massachusetts House, had held the seat since he defeated Barbara L’Italien in 2010. Nguyen ran a very aggressive grassroots campaign, defeating Lyons with 54 percent of the vote. Tram and I were running at the same time and while our districts only overlapped in a small slice of Tewksbury, I constantly encountered her. She was a dynamic campaigner who advocated great progressive ideas with such passion and conviction that it was unsurprising (to me) that she was able to win over so many voters in the conservative-leaning district. Her sharing of this incident has gained some attention with stories about it appearing in her hometown Andover Townsman and also in the Boston Globe. 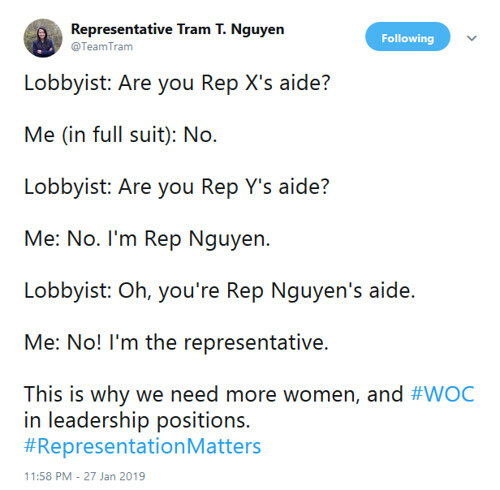 By the end of the week, Tram was back to tweeting about the many bills she was co-sponsoring, but her sharing of this incident was an important reminder of the dynamics of power at the state house. But, it seems that times are changing due to the presence of elected officials willing to speak out publicly on these kinds of issues. Lowell faces many challenges but also has some great advantages over other cities. One such advantage is our many miles of waterfront. Think of all the great cities you have been to. One thing almost all have in common is adjacent waterways. 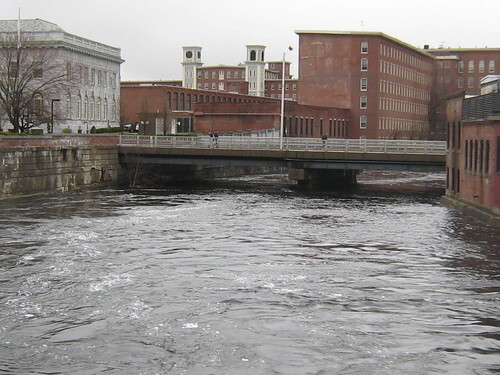 With the Merrimack and Concord Rivers and a half dozen canals, Lowell has an abundance of waterfront property. 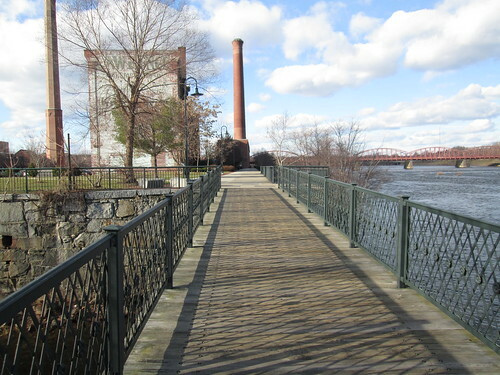 The federal government has poured millions into waterfront walkways in Lowell, especially the Riverwalk which runs along the Merrimack from LeLacheur Park to Bridge Street and which will soon be extended all the way to the Lowell Memorial Auditorium. However, despite its beauty, utility and proximity to downtown, the Riverwalk is one of our most neglected assets, neglected by our city government, our local organizations, and our individual citizens. Perhaps that’s because of the perception of it being an isolated, dangerous place, a perception that was reinforced last week when a young man was stabbed to death on the Riverwalk near the Ouellette Bridge. The Riverwalk is largely ignored until something bad happens on it which just reinforces the perception of it as a place to be avoided. Instead, we should work to draw people to the Riverwalk, for festivals and special events, but also for year-round usage. One of the basics of urban planning is that if there are lots of people around, a place feels safer and more inviting. Just add people! There’s been much talk in the past two months about the great challenge to be faced when the Lowell Judicial Center opens a year from now in advance of the city’s new parking garage in the Hamilton Canal District. Well the timetable for that garage was dealt another setback recently when the city’s request for bids for the construction of that garage yielded only two bids, both of which were 33% higher than the amount budgeted for the garage. The council has already authorized the expenditure of $35mil for this new 900 space garage, but the actual bids came in at $46mil. City officials will now pursue a different bid process that is likely to attract more interest, so this is not a crisis, but it is a timeline setback for a project that can’t afford too many delays. The proponent is requesting a minor modification to the previously approved mixed use building. The proposed changes include reducing the height of the building from 12 to 5 stories, the number of dwelling units from 66 to 42, and the size of the restaurant from 4,270 sq. ft. to 915 sq. ft. So reducing the height of a building by 58%, reducing the number of units by 36%, and reducing the size of the restaurant by 79% is considered a minor modification. We should be glad the developer isn’t seeking a major modification. This past Tuesday night, the University Massachusetts Lowell Office of Multicultural Affairs hosted its annual Martin Luther King Jr. Week Dinner at University Crossing. Art work and poetry from students at the Stoklosa Middle School and St. Patrick’s School were displayed and presented and annual awards were announced. The Faculty Distinguished Service Award went to Sue Kim, Ph.D. of the English Department. The Staff Distinguished Service Award went to Peter Murray of Campus Recreation. 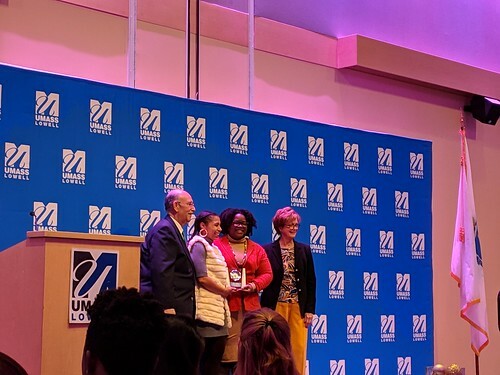 And the Community/Group Distinguished Service Award went to the Kindred Project which is a grassroots organization which seeks to uplift, unite and organize Lowell’s black community. The always eloquent UMass Lowell Chancellor Jacquie Moloney did a masterful job of putting today’s turbulent politics in a broader historical perspective. She first asked how many of the several hundred people in the room had been alive during the Civil Rights movement. Only about 10% raised their hands. (As was fitting for a college event, it was a young crowd). Moloney acknowledged that we now live in divisive times but said that it’s been worse, citing 1968 as an example. She urged people not to despair. The racism and “all the other –isms” we confront now, she said, are left over from the Civil Rights Movement. The work is not finished and there is much left to change, but the tide is turning and she urged everyone in attendance to continue the work. The parking garage is a bad idea. Lowell has plenty of paid parking downtown, and not enough large employers. The parking proposal plans to build an additional garage downtown, however the new lot will be surrounded by water front property, beautifully renovated mills, and a downtown trying to improve walkability & fight congestion’s. This beautiful, prime location lot should not be wasted on another ominous, underutilized parking lot. 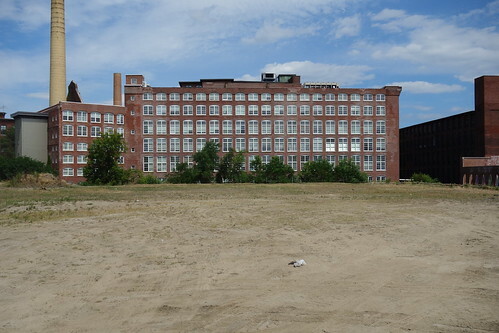 Lowell should seek to add a headquarters for a large employer to strengthen the community by further retaining UML graduates, increasing spending at local downtown boutique businesses (primed for vulnerability during downturn) and increasing tax revenues. Imagine the impact of another Kronos level organization in downtown Lowell? Lowell would thrive with positive financial impact of of Kronos-esque employment wages & scale in beautiful downtown Lowell.